Be honest, sometimes debriefings from group discussions are a real pain. I suffered as participant when the reporting back was too lengthy, too repetitive or too detailed. I also suffered as facilitator because I hadn’t given the debriefing as much consideration as needed. With a weak reporting back session, we risk to lose momentum. The energy decreases; the attention is gone. This is a real pity. 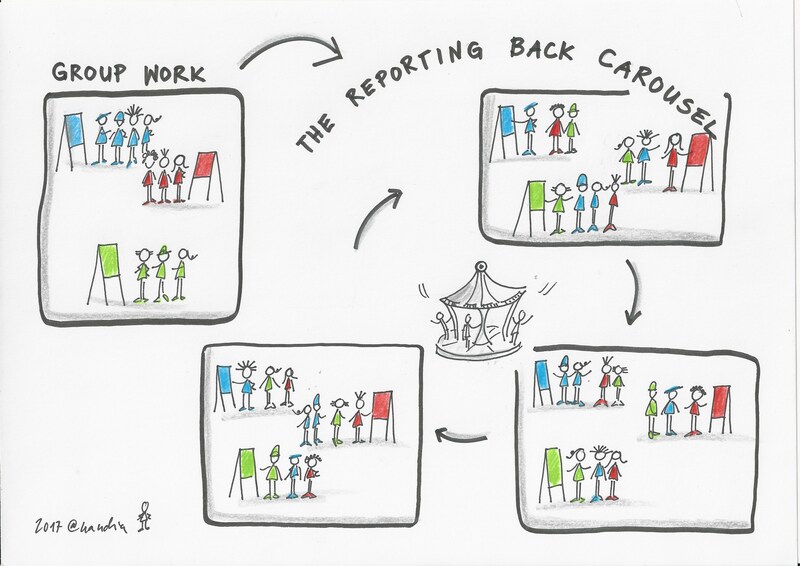 That is why we must design for reporting back sessions that become thrilling learning moments. What we need is clarity. As facilitators and organizers, we must be clear what we want to give back to the plenary and why. The groups need to know what precisely and how to report back. It is maybe true that the only way to become familiar with a conversation is to be there and to be part of it. Being in interaction with each other, we experience the silent moments when the conversation gets stuck and we have the sensation when the group reaches a break through. But at the same time, it cannot be meaningful to repeat a whole discussion. Sometimes it is useful to report back on the process of reflection and the discussion thread, most of the time it is sufficient to share the key points, essential insights or actionable items. My rule of thumb: The groups should give as much feedback as needed to move forward. When the groups digest, summarize, and polish their thinking they are in learning mode. 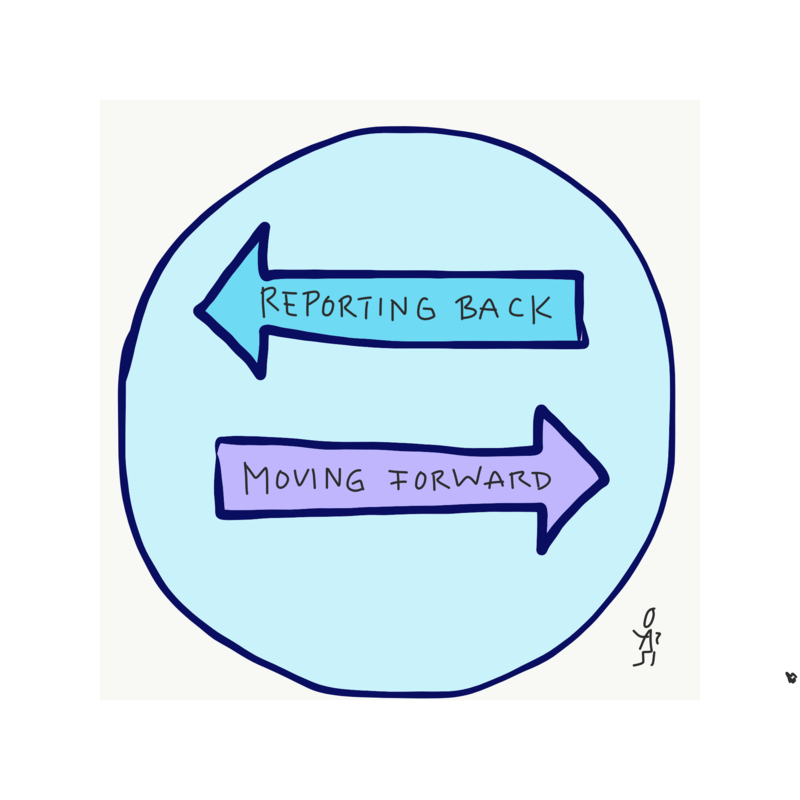 Preparing the reporting back can be an additional catalyst for boiling the discussion down to the essential. We define the reporting back session with the purpose of the discussion and the workshop in mind. We prepare the necessary templates that are attractive and help to bring the discussion to the point. We provide instruction to the group on what to prepare and how to report back. A report can be short or exhaustive; oral, written or visual; it can happen immediately after the group discussions or after the workshop. It can happen in a plenary session or in newly remixed group discussions. We invite the groups to build on each other’s thoughts and to link their discussions; to recognize patterns and identify similarities. We collect unanswered or new questions. The debriefing time of an active-learning group activity is where the class as a whole has a chance to reflect on their collective ideas and make meaning from the experience. By remixing the groups, we can ‘avoid’ reporting back sessions in plenary. Years back, Ernst Bolliger introduced me to the reporting carousel: I still love this simple and dynamic format where everyone involved slips into the role of the reporter. Each group prepares a flipchart for the debriefing. Per group, at least one person stays behind; the other group members join each another group. The person from the specific group gives feedback; then the groups rotate as a carousel from flipchart to flipchart. This format is like the carousel but a bit more informal. Participants split into small groups (groups of three, four or five), each person coming from a different subgroup. They share their insights over a cup of tea or coffee (carrying with them not more than personal notes). The groups visualize their insights on a poster (it is best to prepare a template with the desired categories like ‘key insights’, ‘inspiring quotes’, ‘actionable items’ etc. beforehand. For inspiration see the Cover story by Gamestorming). Invite everyone for a gallery walk; either a “free” walk with informal discussions or as a guided tour. Each group receives three big paper strips to capture a key learning on each one. In the plenary, the strips are read out by the reporting person and then collected on a pin-board. Back in the plenary, some randomly chosen persons are invited to share their insights, observations, impressions, or questions. The Circle Way is a more personal way of reporting back. After the group sessions, the participants join the circle. Going around the circle, each person shares what is on her or his mind. If a person feels not yet ready, she can wait till the circle comes back to her. In pairs, participants go for a walk and digest jointly the discussions they had. Why not a written one pager with title, participants, short summary of the discussion and key insights (as is done in Open Space session reports)? These reports might be handwritten or typed; and shared with the plenary. Composing a learning poem or a Haiku with key insights can be mind-blowing and beautiful at the same time. And it is fun to do. Act it – perform it. One group members acts as the interviewer and interviews groups members. This could be a blog post with short written summary and 1’ video statements. Here a useful link how to make short video statements with your smartphones. The last workshop day: Resolutions for the take-off?